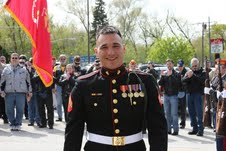 The Round Lake Area Exchange Club and sponsor Collision Solution are proud to announce the May Hometown Hero; U.S. Marine Corporal John Seminary, a Round Lake Park resident and 2008 graduate of Grayslake North High School. Seminary was registered for this honor by family friend, Bruce Johnson, who was present at his homecoming in April. He is home on leave after his deployment to Afghanistan. The honors and medals Seminary has been awarded are; Rifle Expert, Sea Service Deployment Ribbon, National Defense Service Medal, Global War On Terrorism Service Medal, Afghanistan Campaign Medal, NATO Medal-ISAF Afghanistan and Combat Action Ribbon. The club is excited that the family of our hero was at their meeting to receive his award on Wednesday, May 9, 7:30 a.m. at Panera Bread in Round Lake Beach.